The nation’s capital is not only popular for its place in the political realm, it is home to a wide array of famous national landmarks. The city is visited by millions of tourists every year, and for many will always remain the country’s core. Have you ever wondered how these DC structures came to be? The history behind their construction is perhaps as interesting as the finished product; it is amazing to think that the vast majority of these projects were completed in the nation’s early days, and that they have survived many events over the years. The White House, for instance, was built in 1792 (albeit major renovations have been performed since then), making it one of the very first national landmarks. These structures represent the progression of the United States, from where we came to where we are now, and as such they will always be held dearly to the nation’s heart. The White House – Major decisions are made every day at 1600 Pennsylvania Ave NW, a place that has been called home by 44 presidents and their families, the first of which actually selected the building site. George Washington made the decision in 1791, and the construction process was underway within a year (October 13, 1792). The total project took 8 years to complete, and took a budget in today’s’ monetary value of over $3 million. All of the walls are comprised of sandstone, which were whitewashed to give the building its famous name! Lincoln Memorial – In honor of the nation’s 16th president, the construction of this national monument began in 1914 and took 8 years to complete. It is most notable for the large stone sculpture of Abraham Lincoln himself, which is situated on the inside of the structure. Many of the design elements of the memorial are reminiscent of the Greek age, as it contains features similar to many ancient temples and is also comprised of Yule marble. The building is 100 feet tall and 189 feet wide, and it features 36 Doric columns at its entrance. Each of these stands 44 feet in height and they curve slightly inward to give the impression of a uniform look. The foundation was built using standard concrete construction methods, but also includes a massive retaining wall that is made of pure granite. 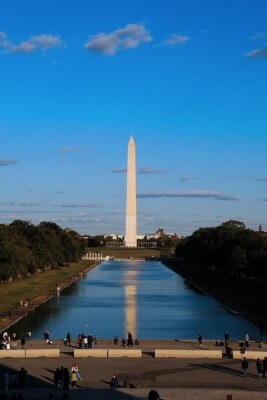 Washington Monument – In the heart of the capital is the tallest obelisk in the world; the monument (built to honor George Washington) stands 555 feet high and was built from various stone materials, including granite, marble and bluestone gneiss. In terms of completion times, the monument is often considered one of the longest drawn out projects. Though the initial construction process started in 1848, it was not finished until 1884, due in part to the Civil War, budget issues and political strife. Upon examination of the structure’s exterior, one can visibly see the differing granite shades, which are indicative of where construction operations resumed. The monument is currently closed to the public, due to extensive damage that was caused by Hurricane Irene and a major earthquake that occurred in 2011.